Cafe Paradiso used to be one of my absolute favourite spots in Cape Town. We used to spend many many afternoons there relaxing and getting a little intoxicated in the sunshine. This spot had a magical combination of a large outside area, lovely buzzy setting and fairly good food. It was sold and rapidly the food went downhill and so did the service. I had two bad experiences and had not been back there for at least 3 years. While enjoying coffee further up Kloof Street I heard the news that Richard Griffiths, from Madame Zingara fame, had taken over Cafe Paradiso. He has a magical touch at creating ambiance and warmth within any restaurant he touches. Many years ago he had a the slightly eccentric Madame Zingara restaurant. This one burnt down and he then launched Madame Zingara theatre shows, followed by in recent times venturing back into restaurants. 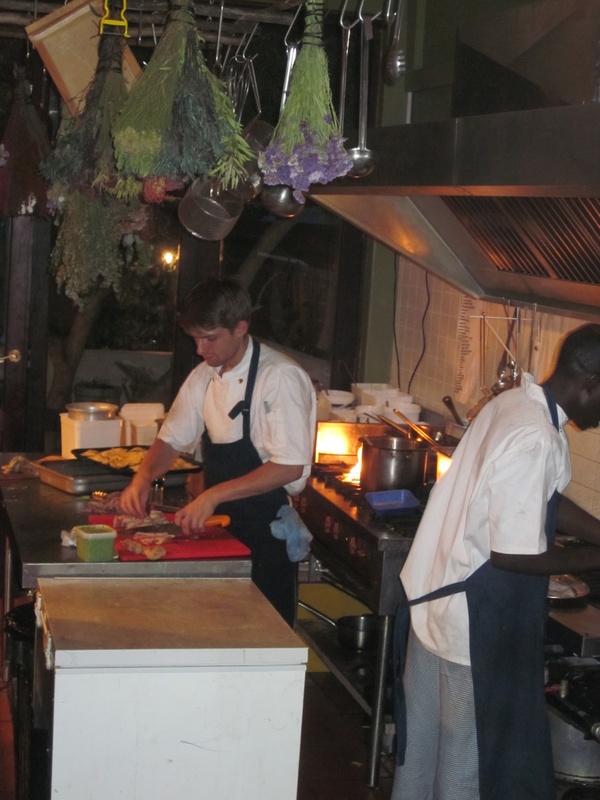 He took the little Sidewalk cafe in Vredehoek that was always desserted, added a few extra items into the decor mix, changed the menu to a bistro style and it is now a very firm local favourite. Next he opened The Bombay Bicycle Club at the top of Kloof Street. This one is full of dramatic decor and even includes a table where there are swings instead of seats – if you are looking for a fun venue for dinner – I can highly recommend this one. Note book well in advance as it is extremely popular. Also note that the Ribs are amazing and that the chocolate brownie is HUGE – so you will be prepared to share it!! Back to Cafe Paradiso. The Madame Zingara group have revamped it and it is looking gorgeous – it now has a relaxed Mediterranean feel, the food had a distinct slant towards this direction too. Everything we ordered was delicious from the cheese and meat anti pasti platter to the black risotto. Once again the magic of the courtyard is back. I would highly recommend a visit – they will be open for breakfast, lunch and dinner and it is a kid friendly environment. I am sure that once word gets out about it, it will become necessary to book in advance. 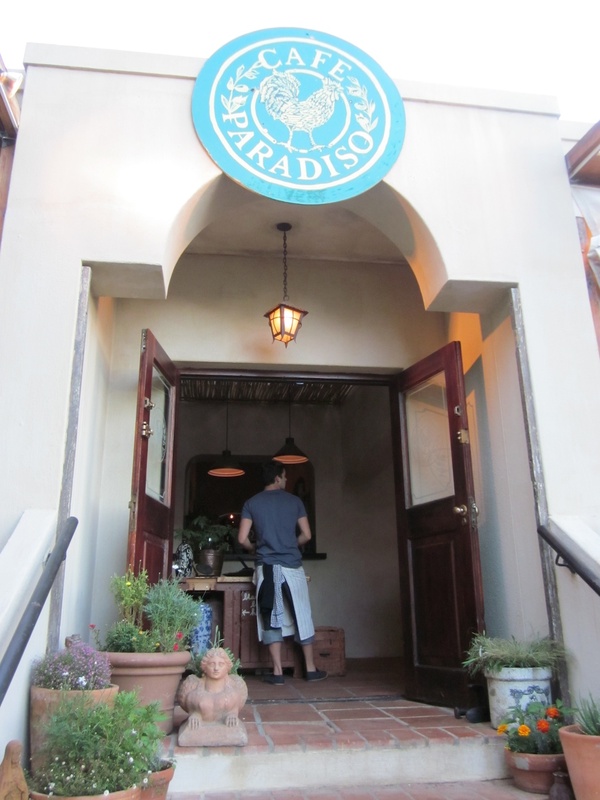 Note that Cafe Paradiso offers fun cooking opportunities for kids – for R45 the kids are whisked off to make their own pizza or cupcakes or ginger bread men. They also have colouring in books and books for the kids. Kids are also welcome to go and watch the baking in the bakery kitchen at the back of the shop. Although they say it is not necessary to book for the kids cooking activities – I have a feeling that during busy times you will have a better chance of making sure they are whisked off by booking in advance! Visit www.madamezingara.com for more info on all of the restaurants.